THE LATEST PICTURES in Eyewitness in Manchester are taken using my brand new Nikon Coolpix 990 digital camera, illustrated on the masthead, upper right. Released in May 2000, It's a far cry from the first camera I used, back in the early 1960's, a Kodak Brownie identical to the one above on the left. 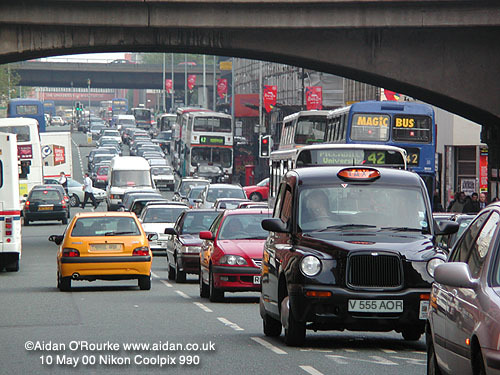 In 2000, traffic congestion in Manchester city centre appears to be getting worse all the time. 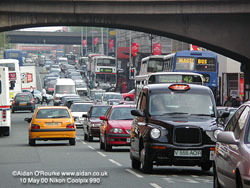 Ever increasing numbers of cars on the road, exacerbated by bus lanes, road narrowing, road closures due to construction work, and pedestrianisation of city centre streets, all add up to more and more traffic jams, such as this one on Oxford Road, captured at about 5.20pm on Wednesday 10 May. Two east-west transport arteries cross over Oxford Road in this view - the Oxford Road to Piccadilly railway line in the foreground, and the Mancunian Way (A57M) in the distance. In the far distance can be seen the Manchester University Precinct Centre, built above Oxford Road. Red and green are the dominant May colours in the suburbs of Manchester and other British cities - the red brick of the houses in bright sunshine, and the lush green of the grass and the leaves, which have only recently appeared. 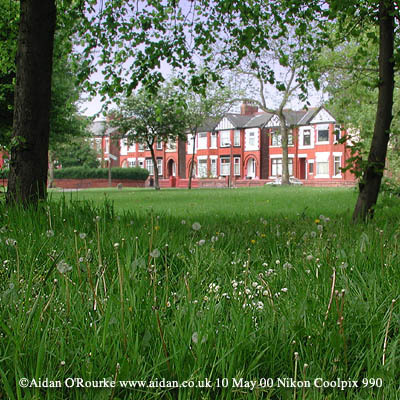 This view was made possible by the removal of a house which used to stand on this site, now grassed over. 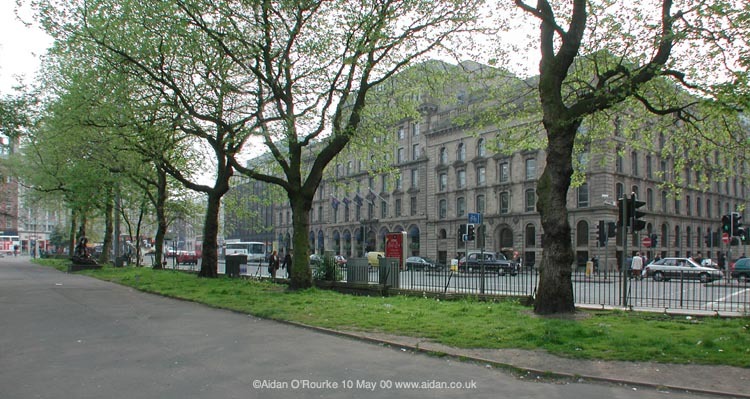 This green and pleasant spot will be obliterated by the office block set to occupy this end of Piccadilly Gardens after the City of Manchester local authority have implemented their controversial redevelopment plan. As architectural historian Professor John Archer remarked recently, this tree-lined view of the former warehouses designed by Edward Walters, architect of the Free Trade Hall, is one of the finest in Manchester. Enjoy it while it's still there.